What are the Dangers and Benefits of Transhumanism? Transhumanism is, essentially, the advanced tech-art of improving both the physical and mental capacities of human beings with the aid of existing and emerging 21st century technologies in the Bio, Info and Nano (BIN) spheres. At present, transhumanism is fast becoming an international intellectual and cultural movement supporting the use of science and technology to improve human mental and physical characteristics and capacities. Transhumanism is symbolised by H+ or h+ and is often used as a synonym for "Human Enhancement". 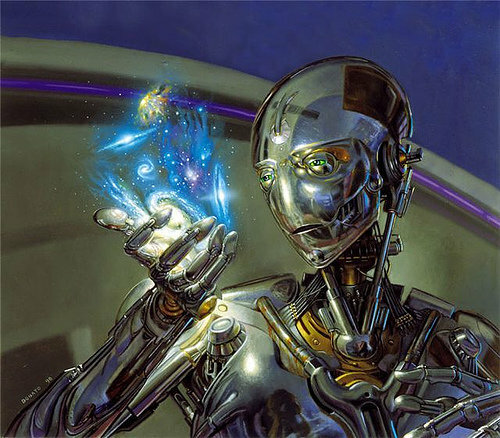 Transhumanism regards aspects of the human condition, such as disability, suffering, disease, aging and involuntary death as unnecessary and undesirable. It aims to: 1. Reduce the affects of disability or physical ailment by providing seamlessly integrated enhancements with longevity; 2. Limiting the duration of injury; 3. Reducing suffering; and 4. Achieving a semblance of immortality of person and/or personality! Transhumanists suggest that human beings may eventually be able to transform themselves into beings with such greatly expanded abilities as to merit the label "Posthuman". Therefore, transhumanism is sometimes referred to as "Posthumanism" or a form of transformational activism influenced by posthumanist ideals. Transhumanists seek to achieve these lofty and not-so-lofty goals by integrating advanced technologies with the human body, as well as preparing the same bodies for yet-to-emerge technologies developed in the near future. The belief held by proponents of transhumanism is that humans will eventually transgress the boundaries of biological evolution via man-made technologies in an attempt to enter a post-humanistic phase. They aspire for the human race to gain expanded physical and mental capabilities to improve the quality of all sentient life drastically. The transhumanistic school of thought has its initial origins in the 1950s. A biologist named Julius Huxley was the first to coin the term "Transhumanism" in a written work (circa 1957) detailing how an human could remain human while transcending the biological boundaries of human physicality and nature. Many other proponents of the ideology surfaced, but the first group of contemporary transhumanists began meeting at the University of California at Los Angeles (UCLA) in the early 1980s. The contemporary meaning of transhumanism emerges from those meetings and has since grown into the global transhumanist movement. As a result of the 1980s, Los Angeles became the centre for transhumanist thought. Transhumanism was further evolved by thinkers like FM-2030 and Natasha Vita-More. Formerly known as futurists, this group of people formulated the contemporary transhumanistic ideology that exists today. There are many possible physical applications of transhumanism in the pipeline, including a few key innovations that most human beings seem to seek. Transhumanistic thought promotes the coupling of innovative new technologies and human biology in fields like cybernetics, artificial intelligence, genetic engineering and modification, nano-technology and cryonics. Innovations in Bio, Info and Nano (BIN) emerging technologies have allowed for the widespread use and development of cellular devices, as well as portable personal effects like smaller hearing-aids, miniscule pacemakers or personal entertainment modules. Advancements in artificial intelligence now allow computers to monitor the vital signs of a patient in a hospital, thereby increasing the speed and efficiency of medical response times in cases of emergency and drastically increasing chances of recovery. Futuristic developments in the fields of biotechnology, genetics engineering and cryonics may lead to designer babies with perfect facial features, or persons being frozen, thawed, revived, and rejuvenated years after supposed death. These, of course, do not outline all the possibilities of transhumanistic modification, but they express an overall attitude towards technology enhanced human improvement in the 21st century. The key question remains: what are the dangers, as well as benefits, of transhumanism? The transhumanist vision of a transformed future humanity has attracted many supporters and detractors from a wide range of perspectives. Transhumanism has been described by one critic, Francis Fukuyama, as the world's most dangerous idea, while one proponent, Ronald Bailey, counters that it is the "movement that epitomises the most daring, courageous, imaginative, and idealistic aspirations of humanity!" The 86th image added to the "E8 Album" within the HQR initiative is of Transhumanism! Visit here to view the image and to contribute to the Socratic dialogue. The "E8 Album" photos at are visual intersections of Spirituality, Science, Art and Sustainability! Feel free to share the images by clicking share or you can tag yourself!